Dr. Larman has developed a method of instructing students that opens the windows and doors of learning for all students that are having problems in learning! This program is guaranteed to open the windows of the minds of students that are struggling in school in reading math or writing, especially children with ADHD dyslexia learning disabilities discalcula disgraphia. Offering professional tutoring, student evaluations and development of program. Dr. Larman’s Neurological Visual Imagery Tactile Impress Method (NVITIM), improves reading, math, writing, and builds confidence in every student. There is no other program in the United States that compares or even comes close to Dr. Larman’s Neurological Visual Imagery Tactile Impress Method for improving student’s grades, math, reading, and writing skills. 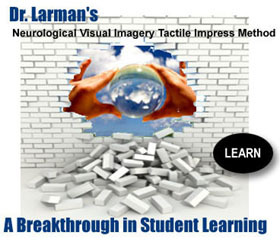 Dr. Larman’s Neurological Visual Imagery Tactile Impress Method is used simultaneously with Organized Systematic Instruction (OSI) that was also developed by Dr. Larman over the past 50 years. Both of his methods used simultaneously, demonstrates amazing results in student’s test scores and improved skill levels for reading, writing, and math. Using both of Dr. Larman's learning methods during every tutoring session, is the most powerful learning technique and learning tool for tutors and students that has ever been developed over the past fifty years! In addition to the use of Dr. Larman’s Neurological Visual Imagery Tactile Impress Method and Organized Systematic Instruction, Sophisticated Confidence Building Techniques are also used during every tutoring/learning session. Most important, Dr. Larman personally trains all tutors/instructors prior to any tutor being approved as a certified tutor for his company. Dr. Larman has been training teachers and tutors at the University and College level since 1976. 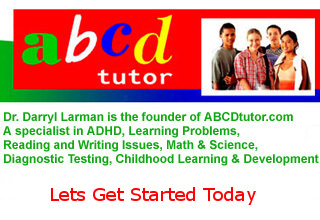 Dr. Larman’s powerful instructional 1 on 1 tutoring program, that he developed, compares to none!